Heat up 3 tablespoons of vegetable oil in a nonstick pan on medium-high heat. Sauté the machaca along with the onion, tomato and Serrano chile for 3-5 minutes, or until onion becomes translucent. Add eggs and let cook. Stir once in a while until the eggs are completely cooked. If you can’t find dried meat, use cooked pulled beef or meat instead. If you don’t like too much heat, use bell pepper instead of a serrano chile. Machaca is dried salted meat that comes in three different varieties: whole (in steaks), pulled or ground. 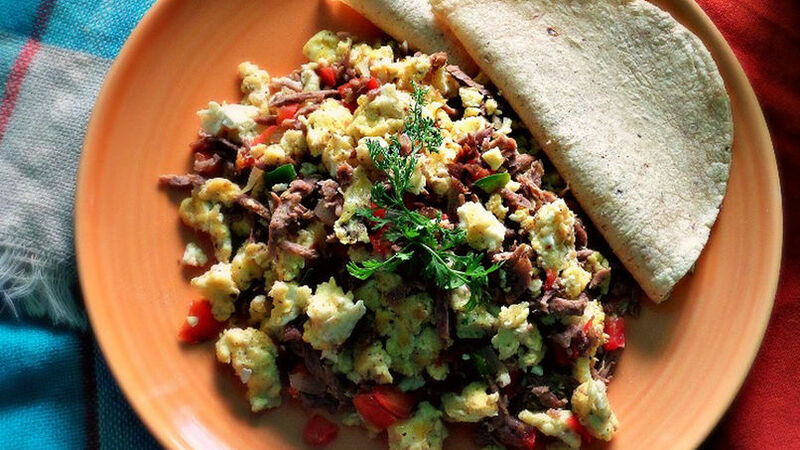 Machaca is very popular in the north of Mexico and can be prepared in many different ways. The most popular recipe is machaca con huevo, a delicious Mexican breakfast that’s super easy to make.